Summary: Ring the Scarecrow is similar to ring toss on a large scale with a Halloween twist. Prop measures approximately 72" high. Prop is made of nylon, plastic, raffia and metal. Prop features posable arms. Has light up flashing eyes,the mouth moves and makes moaning sounds. Requires (3) AA batteries (not included). For indoor or covered porch use. Sound activated. If you made your own scarecrow, stake the scarecrow in the ground. If playing inside, build a stand so the scarecrow will be in an upright position. You can use 1/2" PVC pipe and various connectors. 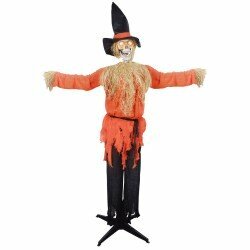 Then attach the scarecrow using plastic cable ties or rope around the neck and spine. Place the scarecrow around 10 to 15 feet away and mark the floor with a piece of tape where players must stand. Each player takes a turn, trying to toss the three hoops, one at a time, over the scarecrow. Players who tie, go into a play off game. The player who successfully tosses the most hoops over the skeleton wins.